Who are France's Red Scarves and what do they want? Police unions and local authorities held emergency meetings on Thursday to strategise — while disparate groups of protesters were sharing plans on social networks and chat groups. The Eiffel Tower, the Louvre museum and scores of shops on the Champs-Elysees are set to close as authorities warned Thursday of fresh violence this weekend during protests which have ballooned into the biggest crisis of Emmanuel Macron's presidency. The government is scrambling to stave off another Saturday of burned cars and running street battles with police by "yellow vest" protesters furious over rising costs of living they blame on high taxes. An interior ministry official told AFP that authorities were bracing for "significant violence" on Saturday, based on indications that protesters on both the far right and far left are planning to converge on the capital. Officials fear they could be joined by hooligans set on rioting and looting, as is widely thought to have been the case last weekend. Prime Minister Edouard Philippe said 8,000 police would be deployed in Paris alongside a dozen armoured vehicles for crowd control as part of "exceptional" measures to contain the risk of violence. 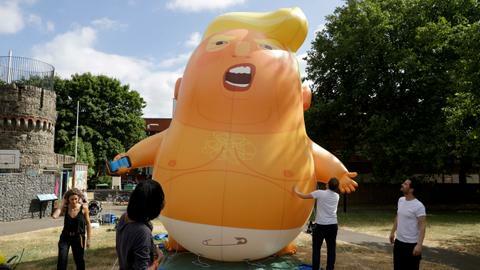 He also reiterated his appeal for calm, saying in a prime-time TV interview that the government was ready to consider "any measure which would allow us to boost spending power". 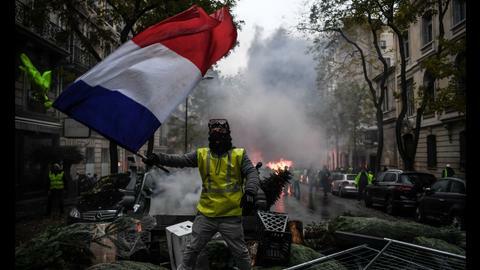 Across the country, some 89,000 police will be mobilised, up from 65,000 last weekend, when the country was rocked by daylong scenes of urban unrest in Paris. But so far the "yellow vest" movement shows no signs of losing steam, despite the government's rollback of planned fuel tax hikes for January, one of the protesters' core demands. Shops along the Champs-Elysees as well as popular shopping streets near the iconic avenue were told to keep their doors closed, protect exposed windows and remove any outdoor furniture including tables and chairs, according to the police notices seen by AFP. The move is likely to cost businesses thousands of euros in lost revenue as tourists and locals alike stay clear during a second holiday weekend in a row. Both the Garnier and Bastille opera houses have cancelled performances scheduled for Saturday, and the doors of major museums will remain shut. A Paris Saint-Germain football game against Montpellier scheduled for Saturday has also been postponed after a request by Paris police, and some schools near the Champs-Elysees have called off Saturday classes. The "yellow vest" protests began on November 17 in opposition to rising fuel taxes, but they have since expanded into a broad challenge to Macron's pro-business agenda and style of governing. The protesters, mainly from small-town and rural France, have broad public support, with an opinion poll this week showing 72 percent backed the demonstrations despite last weekend's violence. 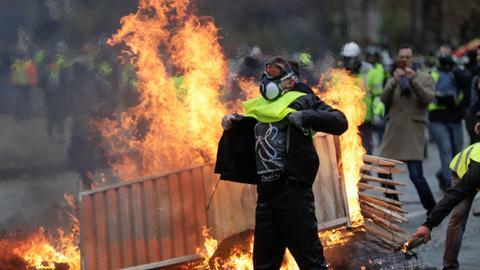 The "yellow vests" have also spurred other protests, in particular students demanding an end to testing overhauls and stricter university entrance requirements. Nearly 280 high schools were disrupted, 45 of which were blocked, in protests across France on Thursday, with more than 700 students detained by police, an interior ministry source told AFP. Dozens of people wearing face masks threw Molotov cocktails, torched rubbish bins and clashed with police outside schools in several cities. 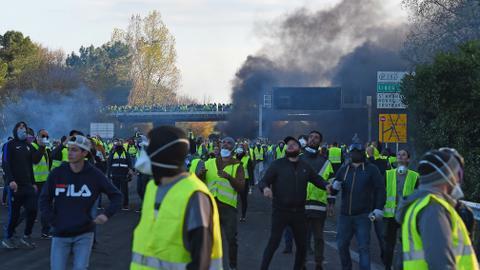 "We're the ones who are going to eventually have to pay higher fuel prices," said Ines, one of around 150 high school students demonstrating in the southern Paris suburb of Cachan. Farmers have also called for demonstrations every day next week, wh ile two truck driver unions plan an indefinite sympathy strike from Sunday night. Meanwhile yellow-vest blockades at fuel depots have caused shortages in Brittany, Normandy, and southeast regions of France. Political leaders from across the spectrum have appealed for calm, after four people died in accidents during protests and hundreds have been injured. 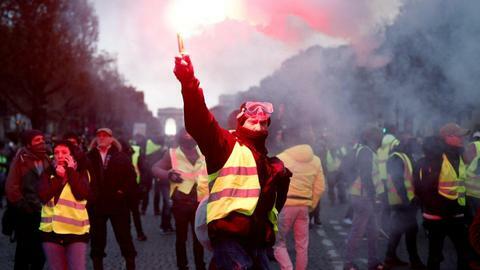 On Thursday a yellow-vest representative, Benjamin Cauchy, called on Macron to meet a delegation of protesters Friday to help defuse a situation that he said had brought the country "to the brink of insurrection and civil war". 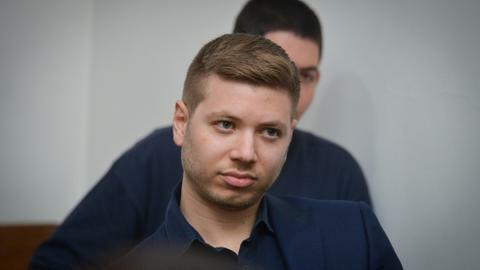 "We're asking him to meet us to negotiate on spending power, which is what underpins all this anger," Cauchy told AFP. Macron, whose approval ratings are down to just 23 percent, has not commented publicly since Saturday on the deepest crisis of his presidency so far. But members of his government have signalled they are ready to make further concessions to avoid new violence after the U-turn on fuel tax increases. But Macron's office said he told ministers he would stick to his decision to cut a "fortune tax" on high-earners, which the former investment banker abolished last year. Restoring the wealth tax has become one of the core demands of the "yellow vests," alongside the fuel tax rollback and an increase in the minimum wage.